These days, a restaurant Cobb salad is usually presented with the ingredients finely diced and arranged in neat strips over a bed of chopped lettuce. Bob Cobb’s original presentation was much more casual, which we prefer. We have, however, tinkered with his recipe, simplifying the salad greens and adjusting the dressing to more modern (less bland) tastes. Our classic Cobb salad recipe includes crisp lettuce, bitter greens, tomatoes, chicken, avocado, eggs and bacon. However, you'll find that this recipe invites improvisation, so we've included a few of our favorite tasty twists so you can make the classic or have it your way! Make the dressing: In a screw-top jar, combine the oil, vinegar, mustard, Worcestershire sauce, pepper, sugar, salt and garlic. Shake well. Assemble the salads: For each individual salad, make a bed of greens on a large plate. 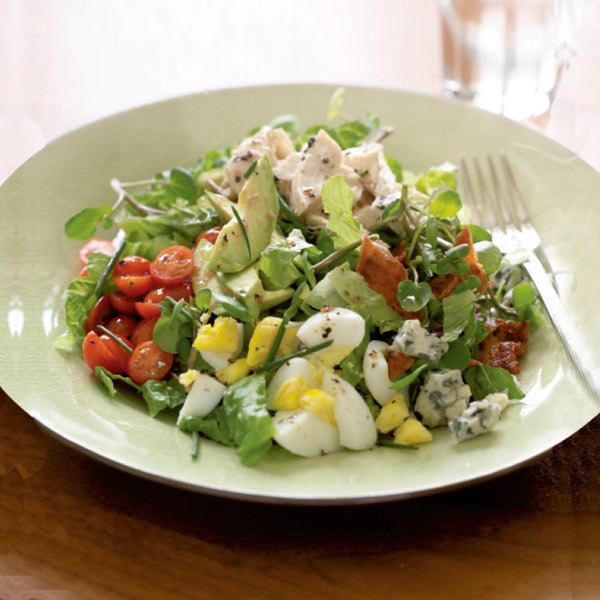 Arrange the tomatoes, chicken, avocado, eggs, bacon and Roquefort cheese in separate groups over the greens. Sprinkle with the chives. Just before serving, drizzle some of the dressing over each salad. Tip: Most of the components can be prepped well ahead of time, except for the avocado, which should be cut up shortly before you assemble the salad. *You can cook the chicken any way you’d like. We poached ours. By using sliced strawberries (2 cups) instead of tomatoes, you’ll have a slightly sweeter mix. Omit the eggs, the bacon and the blue cheese. Add 5 ounces of diced baked tofu, 3 ounces of chopped dry-roasted peanuts and feta cheese. In the dressing, substitute balsamic vinegar and 2 teaspoons of honey for the red wine vinegar and the sugar. Omit the garlic. Use turkey bacon instead of regular bacon, and use only the whites from the cooked eggs. Omit 3 tablespoons of oil from the dressing and add ¼ cup low-fat yogurt in its place. Omit the cheese. This version has 33% fewer calories and 45% less fat.